Organic Bancha (Japan) - 3 oz. Contains ultra-high antioxidant level of 9.55% vs 5-6% for mass-market teas. Character: Fresh green flavor tempered with hints of sweet pear. For many centuries Bancha was the most commonly consumed beverage in Japan before being overtaken by Sencha. 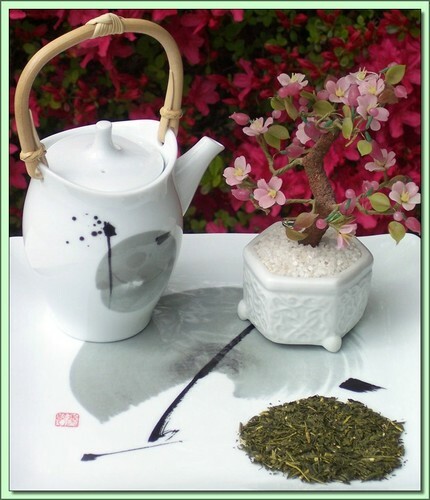 The grade of leaf used for Bancha is less refined than for producing Sencha. Bancha is typically made using second flush leaf plucked during late summer and early autumn. It is characterized by coarse, wide leaves producing a robust and full flavored cup. The tea is grown in Shizuoka prefecture and is harvested by the tea plucking machines Japanese industry is famous for. In Japan, production methods are exacted to a science. In the organic fields where this tea was grown where the absence of pesticide means producers must put extra care and time into cultivating their plants. The result is it is almost impossible to brew a bad cup of organic Japanese tea. Certified Organic by QMI Organic Inc. Certificate #: 150 - 2008. USDA Certified Organic. Hot Tea: This tea is best enjoyed by pouring boiling water over the leaves (1 tsp per cup) for 15-20 seconds (longer=stronger). Don't remove the leaves. Can be infused repeatedly 2-3 times using higher temperatures & shorter infusions until flavor is exhausted.